Andrew W. Mellon, who was born in 1855 and passed away in 1937, gave the National Gallery of Art to the people of America. Originally from Pittsburgh, he was both a collector and financier who in 1921 moved to Washington, DC. There, he served as the Secretary of the Treasury. Throughout his time in public office, Mellon felt that the United States deserved an art museum of epic portions similar to what other nations had. In a letter written to President Franklin D. Roosevelt in 1936, Mellon made an incredible offer of donating his magnificent art collection to a new museum. As part of the offer, he even used his own money for the construction of the building that would in 1937 become the National Gallery of Art. Once finished, the museum was beyond what anyone could have imagined. Having hired world-renowned architect, John Russell, the design was spectacular. All four entrances of the building have formal public entrances and the main floor is beautifully centered around a rotunda reminiscent of ancient Roman times. Barrel-vaulted sculpture halls are located to the east and west of the rotunda, which lead into breathtaking garden courts. To the north and south are interconnecting exhibition galleries with public spaces used today for a variety of reasons. The West Building was completed using state-of-the-art technology for the time, which boasts a light pink Tennessee marble interior, rotunda columns, polished limestone that covers the walls on the primary floor, and Italian marble rotunda columns. To illuminate the space, Russell included skylights covering the entire three-acre rooftop in his design. 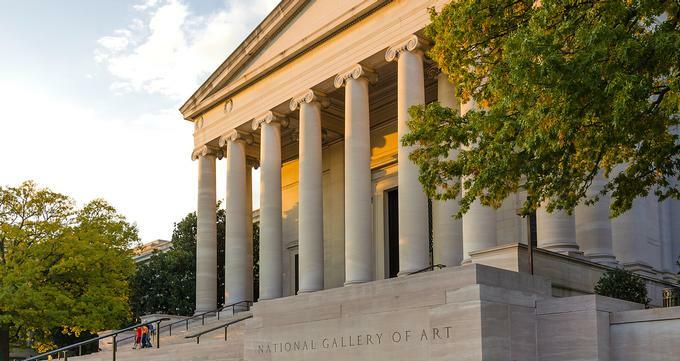 Mellon was strongly convicted that people visiting the National Gallery of Art should have a learning experience while enjoying various collections. Therefore, exhibits are broken down by national origin and period in stunningly beautiful decorated galleries. As an example, the Italian Renaissance galleries feature hand-finished plaster walls detailed with door and base moldings, built-in display niches, and Italian travertine wainscot. In comparison, the Dutch 17th century galleries were designed with wood paneling that captures the essence of the original setting. At the time the National Gallery of Art opened for public viewing, the collection consisted of just 26 sculptures and 126 paintings. However, only two years later, the museum expanded its collection thanks to Samuel H. Kress who donated 18 Italian sculptures and 375 paintings. Then in 1943, Lessing J. Rosenwalk offered an impressive collection of drawings and prints, which eventually reached 22,000. Of those, over 350 woodcuts were from the 15 century. The National Gallery of Art was further enhanced when a collector of American and French art, Chester Dale, lent seven American paintings and 25 Italian paintings from the 18 century to the early portion of the 20th century. He went on to donate 23 American and old master paintings, giving the gallery more credence. Over time, additional collectors made donations, making the National Gallery of Art an extremely important place that people can visit and enjoy. One of the most recent changes to the gallery came in 1966 when it reached an agreement with the National Park Service to create a garden specifically for sculptures. The garden opened in 1999 and to this day, it remains a focal point. Included is a circular reflecting pool and fountain, which serve as the main feature. During the winter months, the pool is transformed into an ice skating rink. Surrounding the fountain are comfortable benches that provide visitors with a place of meditation. Ironically, Andrew Mellon and John Russell both died in August 1937, just 24 hours apart. Although they had the opportunity to enjoy much of the work completed on the gallery, they unfortunately never lived to see its full potential. The National Gallery of Art is a popular venue for various events and programs, including enrichment and educational programs available in person and online. Starting in 1942, the public was treated to free Sunday evening concerts featuring musicians and ensembles from around the world, as well as the National Gallery Orchestra. To this day, these same programs are offered during the fall and winter months. Almost daily, public tours are available for anyone interested in learning about specific exhibits or the gallery itself. As part of this, trained staff members give talks along with tours of different collections and special exhibitions. To ensure that everyone receives the same five-star treatment, on specific days and at certain times, tours are offered in foreign languages. There are also self-guided audio tours for anyone interested in the West Building collections, as well as exhibitions on temporary display. The highly-acclaimed lectures and films are another key offering of the gallery. Presented on a regular basis, both are available at no cost in the auditorium of the East Building, as well as sometimes in the West Building Lecture Hall. On weekends, films that connect to gallery exhibitions are screened in the East Building. Students, teachers, and children are provided wonderful opportunities. Various programs are designed to reach groups of visitors who are excited about the gallery by using family activities, teacher workshops, volunteer opportunities, high school seminars, school tours, films for children and teens, and an annual teacher institute. The goal is to get children and adults to the gallery so they can learn about art in creative and engaging ways. The National Gallery of Art is home to some of the finest art collections in existence. Whether looking at pop art or Byzantine altarpieces, everything is stunning. Although the gallery features a broad range of collections, paintings are among the most popular. The gallery began with Mellon’s prominent collection of 121 old master paintings. In addition, Chester Dale donated French and post impressionist’s paintings, along with paintings from the School of Paris. Thanks to many additional bequests and donations, the gallery has one of the finest collections of American paintings in the country. Sculptures are another huge part of the National Gallery of Art. Although the gallery opened with just 40 sculptures, the collection is significant. Expanding the sculpture collection was Samuel H. Kress and his brother Rush, who working in conjunction with Joseph Widener donated an incredible collection. This gallery remains one of the most respected of all Italian sculpture collections in America. This remarkable collection includes works by some of the most famous sculptors in the world such as Sansovino, Saint-Gaudens, Rossellino, Nadelman, Adriaen de Vries, Gauguin, and many other greats. Visitors can see fine collections up close and personal made form plaster, wood, marble, silver, bronze, ceramic, paper-maché, unbaked clay, and terracotta that date back to 100 BCE. Additional collections at the National Gallery of Art include prints, drawings, decorative arts, photographs, and media arts, each leaving a distinct impression. The National Gallery of Art also boasts the Center for Advanced Study in Visual Arts. This center was an integral part of the East Building opening back in 1978 and it continues to bring scholars together so that art and architecture can be better understood and appreciated. Commonly referred to as CASVA, the center routinely hosts visiting scholars from around the globe thanks to fellowships and sponsored professorships. Specific to members’ research, different meetings and symposia are organized. In addition, volumes related to its seminars, symposia, and long-term research projects are published. In the East Building is a major art research library, which features a massive collection of 400,000 plus books, documents, and periodicals, all relating to architecture, and the criticism, history, and theory of art. However, the main emphasis is on Western Art from the Middle Ages to present time. Included are exhibition catalogues, monographs, and a rare book collection. The department is also home to roughly 13 million photographs, microform images, slides, and negatives, also of Western architecture and art. Another fascinating aspect of the National Gallery of Art is the perfectly manicured gardens both inside and outside of the West Building. The Garden Courts on the interior boasts tropical foliage that provides visitors a place of tranquility. On the outside are magnificent fountains and lush landscaping that enhances the building’s aesthetics. Because plants have been a key part of certain exhibitions for more than five decades, great care is given to growing vegetation. In fact, one of the essential elements of the East Building is plants, with the atrium featuring towering trees. After the Sculpture Garden opened in 1999, horticulture became prominent in the overall design. The National Gallery of Art also has a division dedicated to conservation with the goal of studying and preserving works in different collections. Housed within the conservation division are specialized departments, including those for the treatment and care of paper, photographs, frames, objects, textiles, and paintings. This allows gallery caretakers and other professionals to properly maintain collections so that people can enjoy them for years to come. Through study, experts gain insight into proper and changing methods of care. For anyone interested in experiencing all the greatness associated with the National Gallery of Art can come to Washington, DC. The gallery is located between 3rd and 9th streets, running alongside Constitution Avenue NW. Back to: Best Romantic Things to Do in Washington, D.C.